The author of the blog, which I follow, resp. on which I depend on and a diy projects is Marcela, the best DIY blogger from Czech Republic. In her e-shop sells their DIY projects that would be the envy of the whole Parisian street (in city of Prague). Collar, which she represents, is itself unique. The material of which is collar tailor-made is fleece. Holds its shape, gently encircling the neck and pleasantly heats. This advantage you will appreciate at lower temperatures. It is decorated by hand, embroidered glass beads and pearls (see picture). Autorkou blogu, ktorý sledujem, resp. na ktorom som závislá a na diy projektoch, je Marcela, najšikovnejšia diy blogerka z ČR. Vo svojom e-shope predáva svoje diy projekty, ktoré by jej mohla závidieť celá Pařížská ulica. Golierik, ktorý predstavuje, je svojim designom medzi ostatnými goliermi unikátny. Materiál, z ktorého je golierik ušitý, je flauš. Drží svoj tvar, zľahka obopína hrdlo a príjemne hreje. Túto výhodu oceníte pri nižších teplotách. Je ručne zdobený, pošitý sklenenými korálkami a perličkami (viď obrázok). WOW! You did an amzing job. This is so great! Have a happy Tuesday and be sure to enter to win sponsorship on my blog! . Vypadá náramně skvěle. Ten flauš je příjemný? Nekouše jako vlna? Vyrábí to i ze sametu? To bych to okamžitě koupila. Díky. Opravdu nekouše. Materiálem se hodí spíš na podzim a zimu, ale včera když bylo v Zurichu Čteš mi myšlenky, protože také jsem chtěla samet, ale nevím, jesli by pak hezky stál. amazing post, dear!!! I'd love to wear that collar, you gave me a great idea! 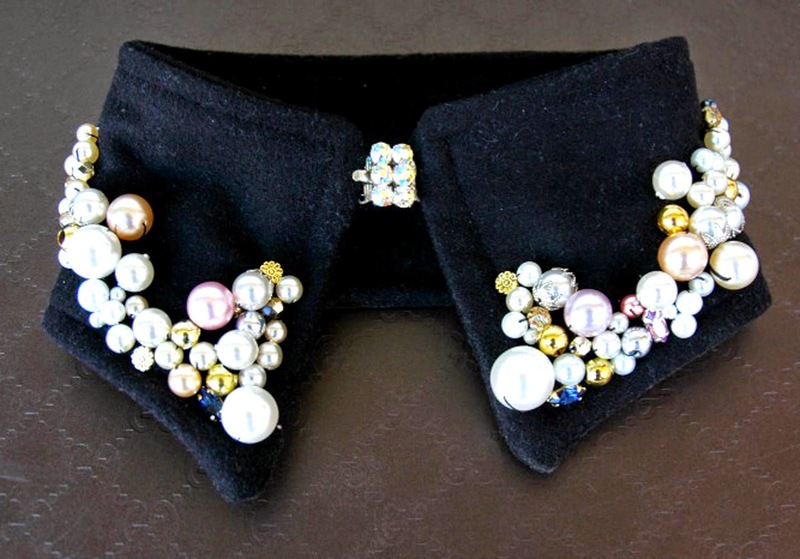 jewelled collars are such a staple now. completes any outfit! This is gorgeous. Love your blog. Hope you'll follow back? Cute collar<3 Thanks for your comment girl! !